Few cities nail the spooky-beautiful-charming Southern vibe like Savannah. Known as "America's Most Haunted City," it's also one of the nation's top cities for ghost tours. There's a ghost tour on every corner, and, of course not all are created equal. We've curated a few of our favorites here for guests who enjoy the spooky side of Savannah. 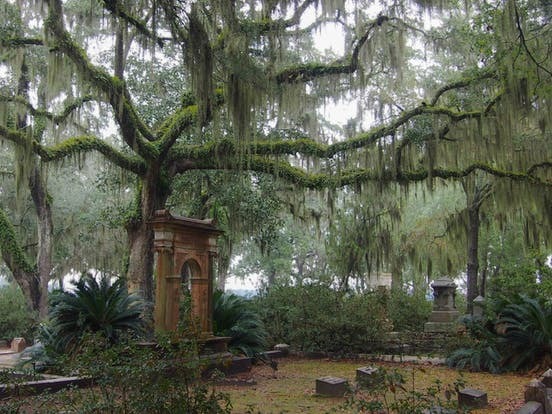 Bonaventure Cemetery is one of the most beautiful cemeteries in the world, and we think it's a must-see. Here you'll see centuries-old live oak trees draped in Spanish moss. The historic graves here are on a scenic bluff overlooking the Wilmington River. There's 100 acres of significant tombstones, sculpture gardens, and Southern Gothic monuments at Bonaventure. We recommend this two hour walking tour by Dash Tours. If you prefer to see Bonaventure Cemetery on your own, it's about a 15 minute drive from The Kehoe House, and we're happy to help with directions. Ghost tours can be a lot of fun, especially in Savannah. We like Old Savannah Tour’s Grave Encounters. Most guests find this tour to have a very mild fear-factor. In fact, it's considered family friendly, so you shouldn't be badly frightened. It is a very popular tour and often sells out, so we do suggest letting us make reservations for you. Two walking tours with paranormal investigators to review folklore, recent accounts, and evidence presented by Savannah's Ghost Research Society.